Thank you for making my dreams come true. I’ve wanted to walk the Camino for what seems like forever. And when I found the onfootinspain website describing the Compostela tour, I thought this is the tour for me. And it was perfect. It was a wonderful journey. What’s not to like?....having an experienced pilgrim (Nancy) who is a wonderful storyteller with expert knowledge of the Camino’s history as well as the region’s history, art, culture and food. And those delicious picnic lunches and wonderful hotel accommodations all made possibly by Nancy, Jose and Marina. You are prendas (old Spanish word for precious treasures). Is Jose available for catering? Brilliant – I couldn’t believe how lucky I was in choosing On Foot in Spain. Debra keeps giving me kudos for finding you! I have such great respect for you and Jose professionally – well planned and coordinated. Everything about the trip was all one could hope for. Your historical and cultural presentations exuded a knowledge and a love for Spanish culture and history. Your ability to smile even under the pressure of a ‘lost’ pilgrim made us all know that you genuinely loved us and loved what you were doing. You took time to single each of us out, to draw us out in conversation. No wonder the spirit of the group was so positive. Jose’s picnics and generous spirit and helpfulness also demonstrated the commitment of both of you to your vocation (notice I did not say job). Ability to manage a variety of personalities…. I have been reminiscing about what was one of the nicest experiences I have ever had traveling…There were many different aspects that when put together culminated in a wonderful experience. These include: the sensitive guide and husband team, the outstanding knowledge of Nancy and local knowledge of Nancy and Jose, the organization which resulted in group having to make NO decisions, the professional approach of N & J, great food, excellent balance between time spent walking, eating, leisure time, ability of N & J to manage a variety of personalities in the group and keep everyone happy, standard of walks, beauty of Spain, fascinating history of the Camino and more…. One of the highlights of my 60 years of life! I think about the Camino experience very often, always with incredible joy. For an experience of only 7 days, it certainly was indelible and one of the highlights of my 60 years of life! I hope to walk more of it in the future – with On Foot in Spain - if possible. My Compostela and scallop shell still hold a place of honor on my living room shelf. Thank you for another absolutely amazing trip! This was honestly the best vacation I have ever had: it was a great mix of city and country; had a wonderful variety of landscapes to the hikes; and the group was so fun. The food was wonderful, especially all the great salads that Jose made. You put so much effort into making the trip go off without a hitch – I really don’t know how you do it! There was really something magical about the trip. From the food to the people to the land, it was just perfect. Thank you and I can’t wait to join you for another! 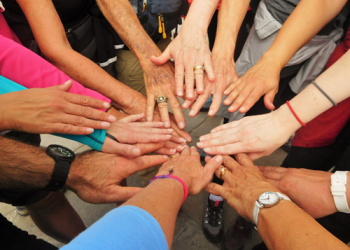 You have a special gift that brings people from all over the world to walk together in harmony while simultaneously fostering the individual perception of the Camino. I think of our experience as "community on foot." Your graciousness, careful planning and preparation, timing & flexibility and extensive knowledge made the trip outstanding and allowed all of us to be together in a mysteriously beautiful way. I really miss everybody. I'm feeling very nostalgic for yellow arrows, warmth, wild flowers, space and wonderful scenery, soaring and magnificent cathedrals, so many stories, history lessons, music, our songs, no decisions, Jose's lunches, Sam's funniness and cuteness, long walks, great company and so much more...... We have been so privileged, I do appreciate it all, and you made all that happen with a bit of magic weaving, .... you gave us all a lot more than most holiday companies would, so thank you so much for making my holiday so special and memorable. I am still savoring all the experiences and delights of walking the Camino with you. For as long as I have memory I will recall and retaste the many lovely and profound moments of our journey. You are an angel. Nancy and Jose, we owe you a special thanks for all of the behind the scenes work that goes into making these trips such life-affirming experiences and for sharing with all of us your special passions and your family. Sam was a joy to be with. You truly have a gift for what you and your husband do…. You made the trip the best with allowing us to get to know ourselves, individuals and the group. You gave us space and yet knew when to come in for a talk, or encouragement or just to experience with us…. Good teamwork. Miss his lunches!!! They just aren't the same here…. Thank you for everything you and your family did to make it a most memorable trip. 5 [of 5] is not high enough. We have been on other tours and this is the best one ever. We hope we can join you for other tours. Thanks for a wonderful time on the Camino. Your planning was meticulous, yet flexible...The structure of the whole journey was excellent with plenty of time for each of us to be alone or with whomsoever we chose. The walks that you selected were clearly representative of the whole trail, as we saw in the movie “The Way” which we saw recently. It brought back great memories – the cut out metal statues near the windmills, the villages, and “our” Romanesque church. The picnic lunches were so exciting with new discoveries each day, including the alliterate salad. The accommodation and evening meals were top rate and we very much enjoyed our last nights in the Parador.